Far from its origins as a simple fishing community, the Stann Creek District's Placencia is one of Belize's coolest little-known tourist destinations. Although the area has been re-developed many times, it never lost its quaint style, and it's just a short trip away from Belize City by air or car. 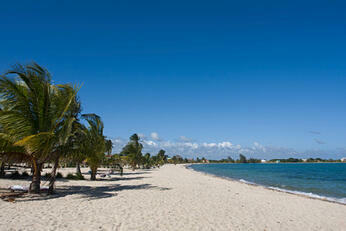 Placencia is actually a long peninsula that has seen numerous settlements over the ages. The current village is very small with only about 750 permanent residents. The local geography is as diverse as the many groups of people that originally made their home in the area. While one side of the peninsula sticks out into the Caribbean, the other side hosts a sheltered lagoon. Like the rest of Belize, Placencia is known for exotic animals. Placencia Lagoon is a huge nursery for many kinds of rays, and its calm water is regularly inhabited by dolphins and manatees. There are also mangrove forests, wetlands and expansive beds of tall sea grass. Naturally, fishing is popular here, and people catch barracuda and other species on a routine basis. You can also see whale sharks on the seaward side or visit the many wildlife sanctuaries and reserves in the surrounding region. One very popular destination, Cockscomb Basin Wildlife Sanctuary, is a day away, but it's home to a jaguar forest preserve, hundreds of bird species and a dozen self-guided trails. There are numerous Mayan ruins on the nearby mainland as well. Placencia's Maya Beach is about 1.5 miles long, and it bears homes, resorts, restaurants, bars and an art gallery. You can also visit the nearby historic Seine Bight Garifuna settlement and take in some of the local culture. Placencia's Lobster Fest, Easter Week in the spring and the Placencia Peninsula Arts Festival are great ways to enjoy traditional Belizean customs all year long. Also keep in mind that no matter how you decide to spend your Placencia trip, you can always take things in at your own pace via boat or canoe. Placencia is one of those places where time seems to freeze. It's home to many of the typical tourist attractions you might expect from a tropical nation like Belize, but it's also well-known for its quaint atmosphere and proximity to attractions like Mayan archeological sites. Although Placencia Peninsula was historically home to little more than fishing communities, it has developed unique modern amusements of its own, including whale shark-watching and dolphin tours. In addition to art galleries, traditional historical settlements and yearly local festivals, there are multiple natural reserves and eco-tourism excursions to take in, so make sure you don't forget to stop by Placencia at some point during your next Belize trip.